Hooray for GM's 500 millionth vehicle? 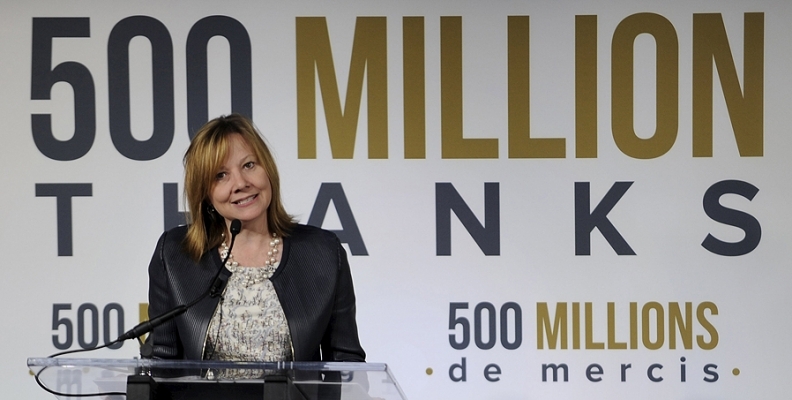 GM CEO Mary Barra celebrates the company's 500 millionth vehicle earlier today. DETROIT -- General Motors CEO Mary Barra and other top brass are in Kansas City today to mark the company's 500th million vehicle. It must be hard for GM to decide when to celebrate its considerable corporate heritage, and when to pretend that it doesn't exist pre-2009. A GM press release ticks off an impressive list of innovations that have rolled off GM assembly lines among those half billion vehicles over 106 years. The first V-8 engine. The first automatic transmission. The first production airbags. All stuff to be proud of. But wasn't it just a few weeks ago that GM's attorneys were in a courtroom straining with every legal argument they could muster to distance the current GM from the old, pre-bankruptcy one that made 2.6 million small cars with defective ignition switches now linked to 97 deaths? I can see the snarky tweets now: 500 million vehicles -- and 470 million of them weren't recalled last year! The problem with today's event is that it celebrates quantity. GM knows -- perhaps better than any company on the planet -- that the ability to manufacture a lot of product, in and of itself, is no cause for celebration. How many of those 500 million cars and trucks had no business being screwed together  in the first place? How many were cranked out during GM's ill-advised (and unsuccessful) push in the early 2000s to regain the 29 percent market share, an era that saw executives donning "29" lapel pins to symbolize that arbitrary line in the sand? Celebrating 500 million only serves to remind people that GM is a big, industrial company that's been around a long time. It says nothing of the nimble, innovative one that Barra & Co. are working to build. It’s a mixed message at a time when GM and its brands need all the clarity they can get.